Hi guys! Just another really quick #OOTD/#MOTD mix today. I went out clubbing a few weeks ago and I definitely took it as the perfect opportunity to dress up! Sorry for the pretty rubbish photography, I find it so difficult to find people to take them for me so these will have to do for now! I wore a dress I got in the Topshop sale literally about 6 months ago and this has been my first chance to wear it! It was around £20 reduced from £48 (I think). 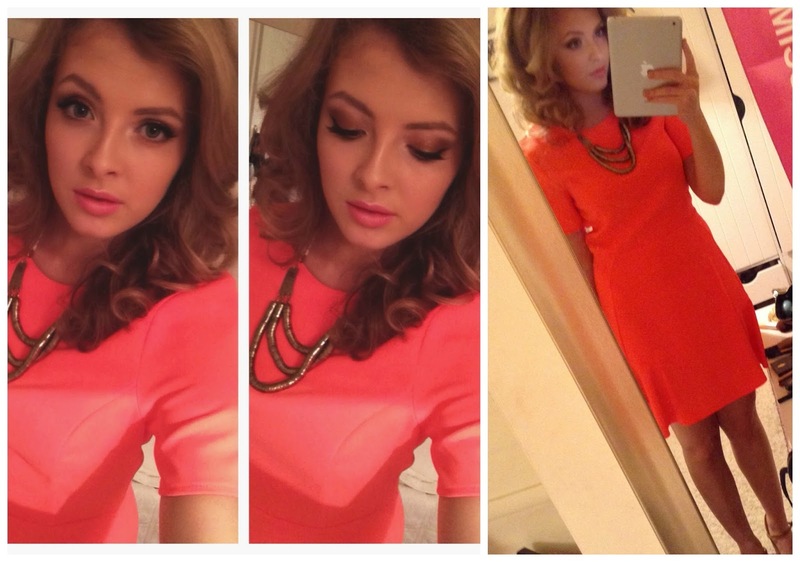 I love this bright coral colour as I feel like it really compliments my hair colour and skin tone. I paired that with my reliable gold and brown wedges from Zara. These have been honestly one of my best buys as they are so comfy to walk round in when I'm out, I've worn pretty painful heels in the past when I've been out (example A) so these have been a lifesaver! If you follow me on Instagram, you will have seen the makeup picture but I thought I'd go into a bit more detail about what I used here. For my skin, I always use the Illamasqua Skin Base foundation when I'm going out. I got it in London in May and it has been my go-to full coverage foundation since. I did my brows with my beloved Anastasia Brow Pomade and Brow Wiz, and used the Charlotte Tilbury Dolce Vita palette on my eyes, with Ardell Demi Wispies lashes. I highlighted with theBalm's Mary Loumanizer, and used NARS Laguna bronzer and Milani Baked Blush in 'Luminoso'. I also usually contour with my MAC Pro Concealer Palette after I've applied my foundation. You can see my review of that here. On my lips I used Urban Decay's lipstick in 'Streak' - obviously! You can see my multiple raves about that here.